deepin 15.4 GNU/Linux will be released in April 2017. Here is a review of its Beta Version showing some interesting aspects: memory usage, new appearances, new programs, and more. 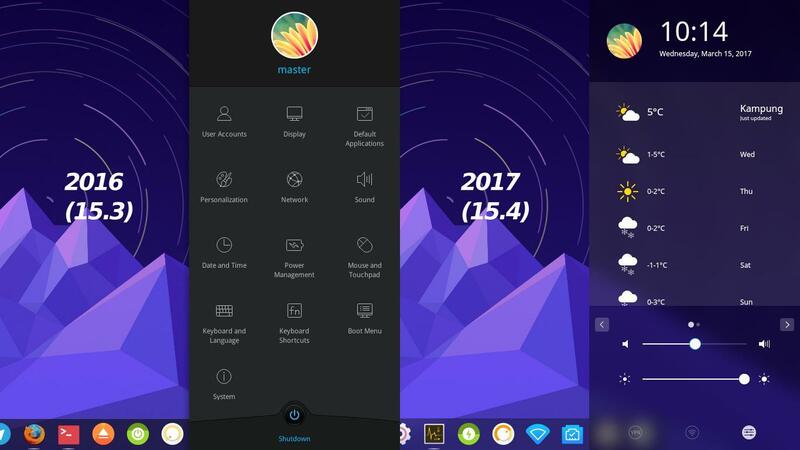 This new 15.4 has big improvements in its user interface, making it more beautiful, plus a new program called Deepin Screen Recorder. It's very interesting for any GNU/Linux user to take a look. This review is a continuation of our previous review in 2016 for Deepin 15.3 GNU/Linux. 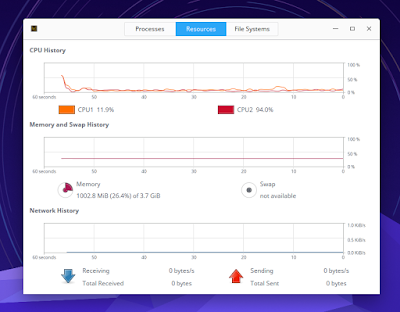 In my Acer Aspire One 756 (Intel Pentium 967, 2GB RAM) deepin 15.4 consumes 1GB of RAM when idle. It's two times bigger than the previous 2016 15.3 version. It is now in a same line as Ubuntu 16.10 (1GB) and Ubuntu GNOME 17.04 (1.4GB). It's a warning for old computer users, especially when your RAM capacity is lower. 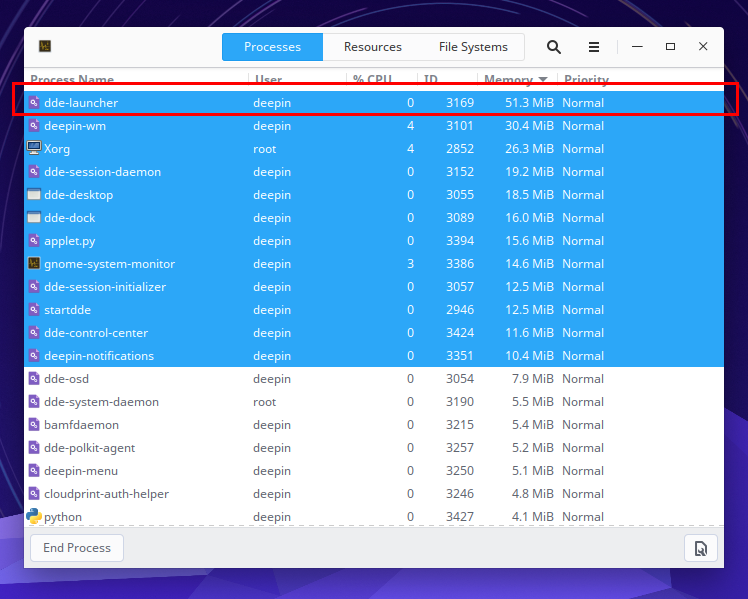 At beginning of idle time, the biggest process is dde-launcher with 52MB of RAM. This dde-launcher is the process that run the desktop menu (when you press Super key). But when the desktop has being used for some hours, you may notice the biggest one changing to deepin-wm with more than 190MB of RAM. 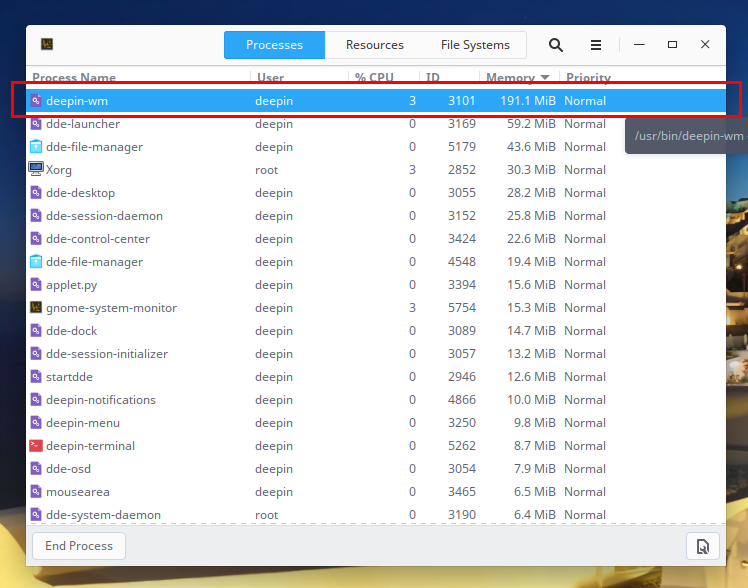 This deepin-wm is the Window Manager (hence the name, WM) of Deepin Desktop Environment. This process draws every window border, the close-min-max buttons, desktop animation, and the drop shadows. These number of RAM usages may grow bigger and bigger according to the usage time and your task loads. Deepin 15.4 will only support 64 bit. You can get the Beta image here http://cdimage.deepin.com/releases/15.4.Beta/. Get the md5sum here. The final version 15.4 will be released in April 2017. Another future releases for 2017 are 15.5 in July, 15.6 in September, and 15.7 in December. See References. 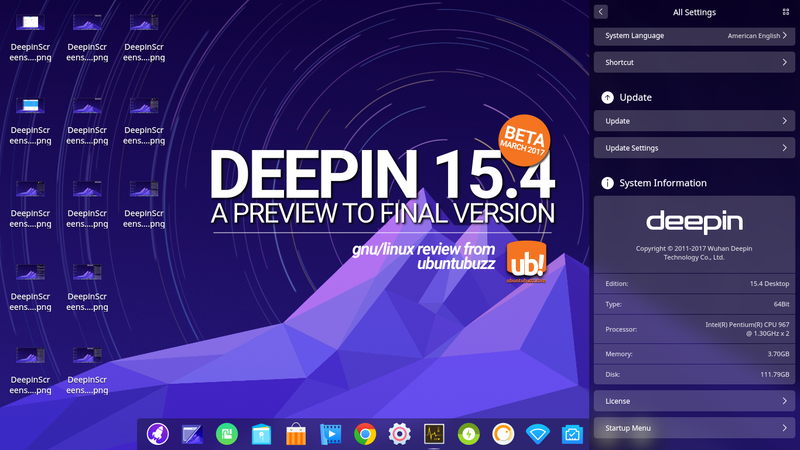 deepin 15.4 got major overhaul on its Control Center (the right-panel) compared to 15.3. As a summary: the overall appearance is now translucent, it's now sorted vertically so scroll it top-down to see submenus, and it has many improvements such as horizontal sliders. 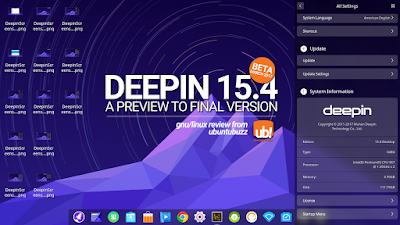 They made deepin 15.4 user interface more user-friendly than 15.4. 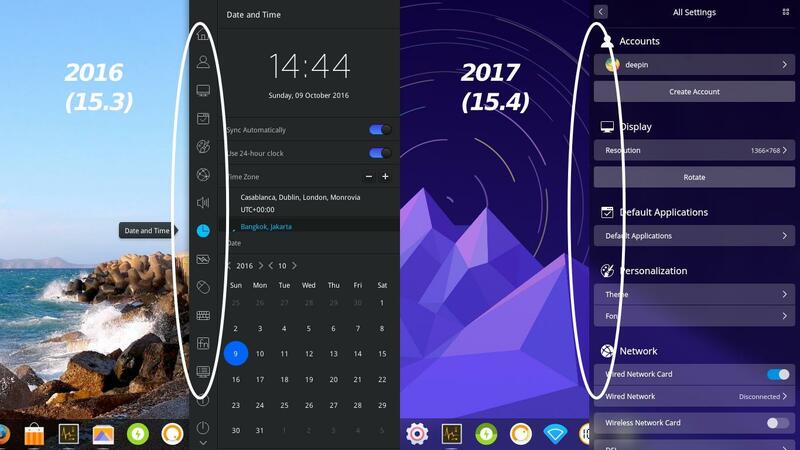 Deepin Control Center, the right-side panel, now organized in a scrolling top-down style, instead of clicking top-down as in 15.3 2016. So now in the right-panel there are no buttons arranged vertically on its left edge. 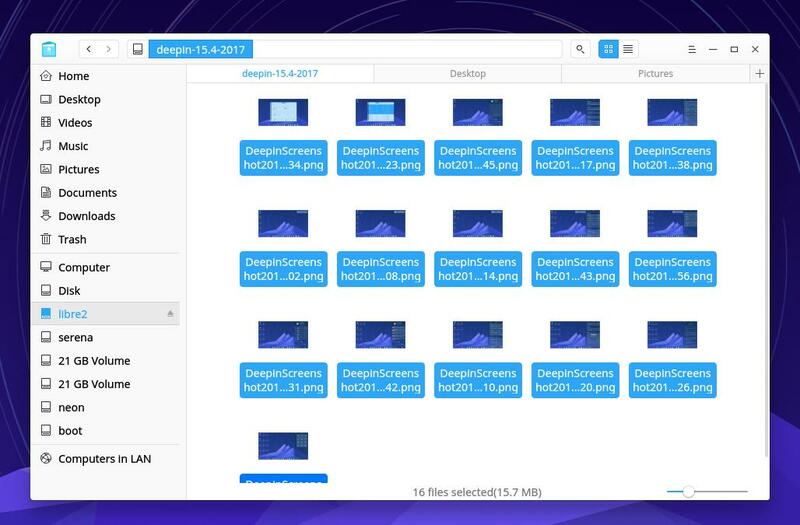 Deepin 15.4 has a new program named Deepin Screen Recorder to make screencast of your desktop. It's similar with Kazam in GNU/Linux, or Camtasia in Windows, and it's built-in in Deepin. It's default formats are MP4 and GIF. The file manager now has multitab feature, just like any other GUI file manager in GNU/Linux. Last year I said "It has no multiple tab, just like Windows Explorer..." and now that's expired. Personally for me, this is the most important interface improvement for daily usage. The official release notes page mentioned some fixes such as problem with weather widget, memory leak, bug about WLAN in dock, and so on. deepin 15.4 comes with Linux kernel 4.9.0, GNU Bash 4.4.0, apt 1.1 and aptitude, 0.8.3. For the graphical apps, it comes with (as usual) its own deepin-branded apps such as Deepin File Manager, Deepin Store, Deepin Music, Deepin Movie, Deepin Image Viewer, Deepin Help, Deepin User Feedback, Deepin Terminal, and the brand-new Deepin Screen Recorder. 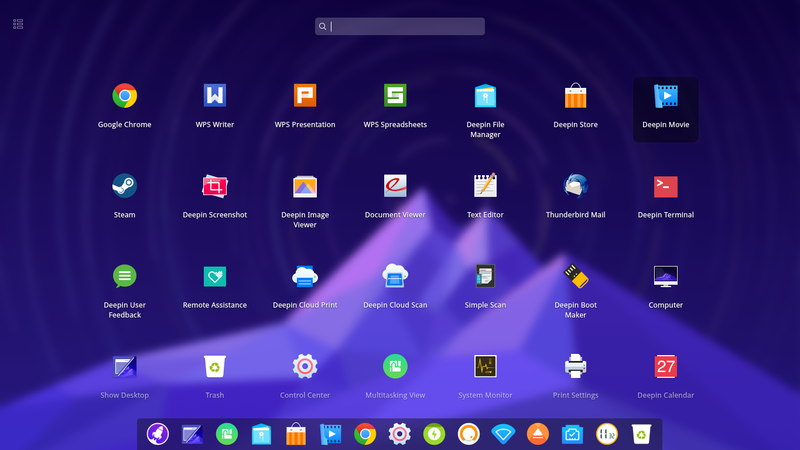 Same as before, deepin includes Steam, WPS Office, and Google Chrome. Unfortunately, they are proprietary software. I wish either Deepin Team replaces them with free software counterparts or (it would be better) every original developer of them changes their licenses to free software. If you are developer, please read that free software is important for all users. deepin 15.4 is already beautiful GNU/Linux for desktop. Using deepin desktop is like dreaming, how can a GNU/Linux be as pretty as this? It's whole user interface is now improved, it's more usable than before, and it serves user's common daily life thoroughly by default. The unfortunate news is its huge memory consumption. Also honestly I cannot agree with the inclusion of the well-known nonfree software WPS and Chrome, because they already have free software counterparts: LibreOffice and Chromium. Looking at its beauty, Deepin needs to be shipped inside an official powerful hardware, say it, Deepin Notebook or Deepin PC. It will be amazing to see beautiful GNU/Linux in powerful machine shipped officially. I imagine someday Mac users could switch to Deepin Machine. And one important thing, I wish Deepin Team reconsiders seriously to replace the proprietary software (WPS Office, Chrome) with free software (LibreOffice, Chromium). If you are a Deepin developer, please consider this FSF's guideline.